All of our cottages are located in incredible locations throughout Western North Carolina. Some are located in gated communities and all have access to extra amenities. Please contact your reservationist for more detailed information on specific cottages. What is Sundrops on Caney Fork? Located 4 miles from Western Carolina University and 15 minutes to historic downtown Sylva, Sundrops On Caney Fork is the #1 amenitized community in Cullowhee, North Carolina. The private clubhouse offers a covered pavilion complete with fireplace, outdoor kitchen, large dining area, and restroom facilities. The indoor clubhouse area boasts upscale furnishings, a television complete with media library, and an additional kitchenette and dining space. 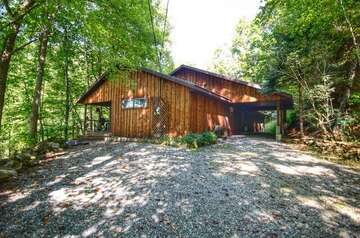 All of these amenities overlook a resort-style infinity edge pool and hot tub area with unobstructed scenic vistas of the Caney Fork Valley. Guests also enjoy access to the fitness center on the lower level. The community is pedestrian friendly with walking trails through the meadows and by the water. Try your luck trout fishing on the banks of the Caney Fork Creek, but don’t forget to pick up your NC fishing license! What is Bear Lake Reserve? Bear Lake Reserve is a master planned gated community on Bear Creek Lake. The resort offers a clubhouse, restaurant, bar, pools, hot tubs, fitness center, children’s play area, theater and marina. The clubhouse includes on site activities director with many programs for children as well as adults. The restaurant has great burgers, sandwiches and gourmet dining with an expansive wine selection, local beers and a large bar with lounging area and ample indoor and outdoor seating to enjoy the lake views. There are multiple heated pools, hot tubs and a slide for children. The fully outfitted fitness center has a sauna, steam room, and locker room with showers. The state of the art 20 seat theater is stocked with DVDs or bring your own. The children’s play area is stocked with toys, games, TV and video games. The library offers a quiet secluded place to kick back and catch up on some reading. The clubhouse is 20 minutes from the main entrance of Bear Lake Reserve on the main road. Yellow reflectors on the road to the clubhouse are useful for navigating the resort in the dark. We accept MasterCard, Visa, Discover but not American Express. To reserve your cottage use the Book on-line feature of the website or give us a call. A security deposit may be required, depending on the terms of the agreement between the homeowner and Sundog Vacation Rentals. We charge the remaining/full balance due for the reservation the morning, and we will provide you with a receipt at your check-in. Guests assume responsibility to care for cottage, furnishings and amenities. You will be charged for any damages, breakage, loss, excluding normal wear and tear, and will appear on your final statement. *Rental rates do not include tax, pet fees, cleaning fees, or special request items. What if I have to modify or cancel my reservation? Modifications and cancelations are allowed 2 weeks prior to the date of check-in. If canceled within the 2 week window, our policy states that you will charged for at least one night’s stay and may or may not include other taxes and fees. Guests will need to begin their vacation at the Sundog Vacation Rentals’ Check-in Office. Check-ins are welcome beginning at 3pm, if and earlier check-in time is requested please call 877-SUNDOG1. Directions to our check-in office and other information will be sent via email prior to check-in. When and where do I check out? Check out time is by 11:00am on your day of departure. Keys are to be left on the Kitchen counter of your cottage or at the check-in office . All trash must be bagged and placed in the proper receptacle and all Linens and towels placed in bathroom, and $50 Fee will charged if trash is not properly discarded in the receptacle. There will be a charge of ($25) for any lost keys. Can I get cell service on premises? Cell service is very limited in the mountains (Call 877-SUNDOG1 for more details). There is a phone (land-line) provided in the cottage. Phone limitations differ per each rental, some include unlimited long distance. You can ask your reservationist about your specific cottage. There is a land line available at the Greeters Cottage of Bear Lake Reserve, and we also suggest using a prepaid phone card if you prefer. Wireless internet is available at all rental properties. Wifi is also available at the Sundog Vacation Rental Check-in Office during normal business hours. Are TV and DVD available? Most cottages have Satellite/Cable TV and DVD players. Ask your reservationist about specific cottages for details. Boats are welcome but depending on the specific cottage some do not have the space required to park. We have designated parking areas in the event that there is insufficient space at your particular cottage. Motorized boats will need to be trailered daily to/from the adjacent public boat ramp. We do not have a dock to tie up to. If you are staying in a property on Bear Lake Reserve, then you are permitted access to rent various boat and water sport items from the Marina at the Bear Lake Reserve Lake Club. Please call the Lake Club at (828)293-7414 for more information on rental prices and reservation times. The processing fee is approximately 4% of the total price of your rental rate, cleaning fee, and resort fee (if applicable) before the NC sales tax rate is applied. Can I swim at the lake? You are welcome to swim at your own risk, but no jumping from the dock. There is no lifeguard on duty. All of our properties including homes in Bear Lake Reserve and Sundrops On Caney Fork are non smoking facilities. If it is discovered smoking occurred within a cottage, guests will receive a $250 fine, plus any additional costs for cleaning or damage. How do I get to SUNDOG Places Check-in Office?